Our living room and dining room all are “open concept”, so it is one large room. Yesterday I posted a tour of our living room, so today I’m giving the rest of the room tour. In the dining room sits a “Library Table” that my maternal grandfather made. It’s a solid slab of redwood and is getting close to being 100 years old. The design of it is very dwarvish (yes, we’re huge LOTR fans!) and it’s a bit on the smaller side, so we have to squeeze in to eat our meal. 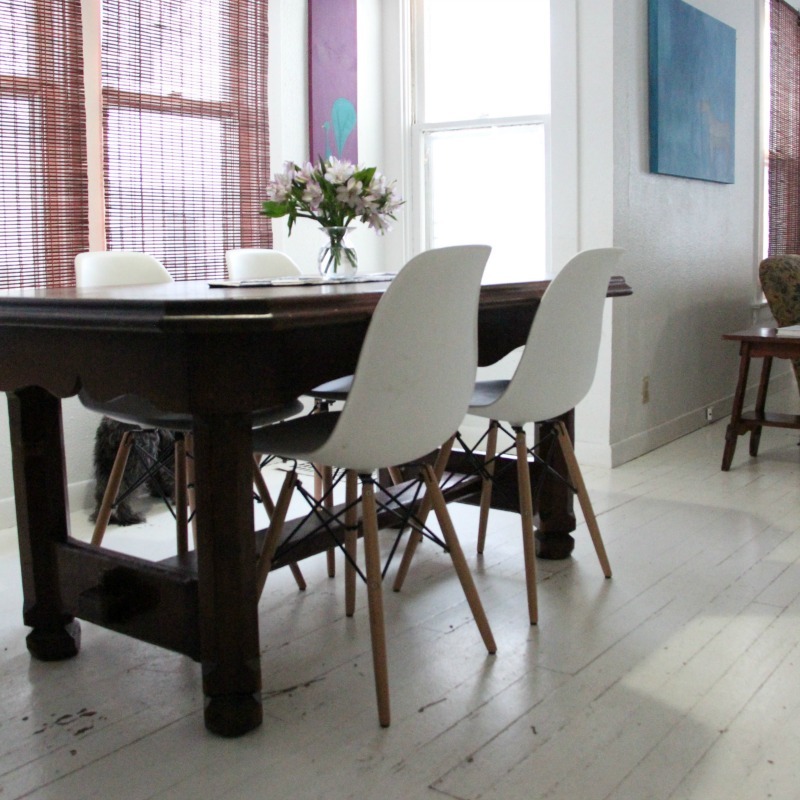 When friends come for dinner, we pull out a card table to add some seating. The chairs are from Amazon. At this point, with small children, having furniture that is functional and can get messy means I’m much more encouraging of painting and craft projects. 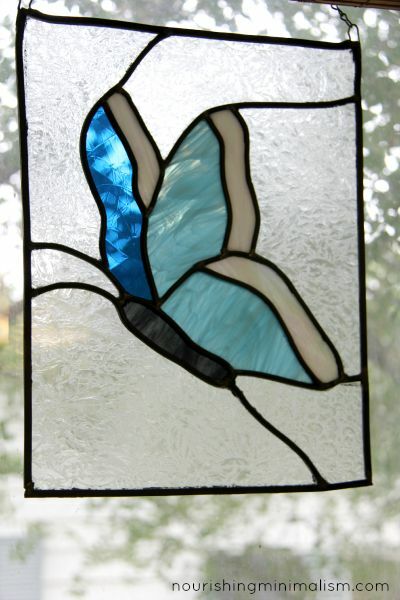 In the window by the dining room, hangs a stainglass butterfly that was made by my paternal grandfather. After he retired he got into creating these and while growing up, my parents had an orange butterfly of his hanging in their window. Incorporating family pieces into our decor has been really important to me. I did have to narrow it down to just the items that I loved, as all my grandparents had many possessions. But having just a few special pieces has been a great reminder to me of the relationship that we shared. On the other side of the dining room table sits our piano. It’s the piano that I grew up with and had been in a fire but refinished by the school of the blind. My parents took my grandmother’s piano, so I inherited this one. It’s a beautiful instrument and all 3 of my older boys learned to play. The younger ones will have their turn soon as well. 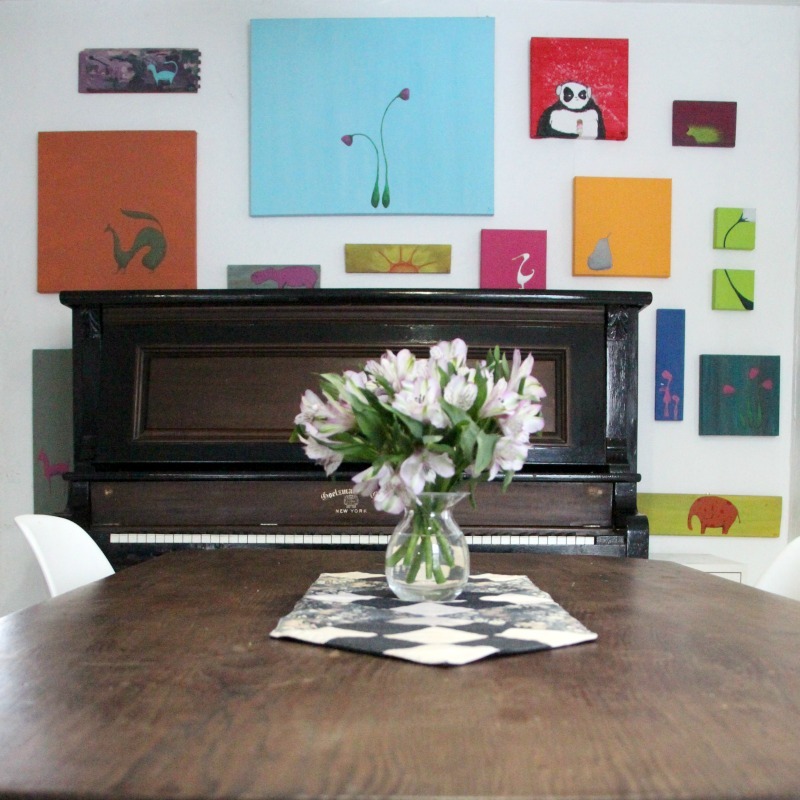 Around the piano is a collage of paintings. The panda is the only one that is not mine. It’s actually from our friend Sean Thomas, who is currently using his artistic talent to create stunning pipes. I love bright colors and as you can see, I’m fairly minimalist minded in my art as well. This wall is packed with paintings and I love it. I know many people think of minimalist decor and don’t expect anything on the walls, or at least very little. This is our living room/dining room organizer. We struggled for so long on how to refer to it, we finally just named it George. Now, if someone needs something I can say “It’s in George.” and they can go right to it. In George, we keep toys, books, craft supplies, tablecloths, napkins, hot pads, wifi, and all charging cords. It’s a large piece, about 5′ long, similar to this one. In one of the baskets I also have my “inbox,” this is where all bills and papers go that need to be dealt with. The surface on George is the most challenging for me to keep clear. It’s the perfect height for everyone to set things on. I have to clear it at least once a day and make the kids put things where they belong, not just where it’s convenient. Above George is Brian’s space. He’s started his collection of sharp things. 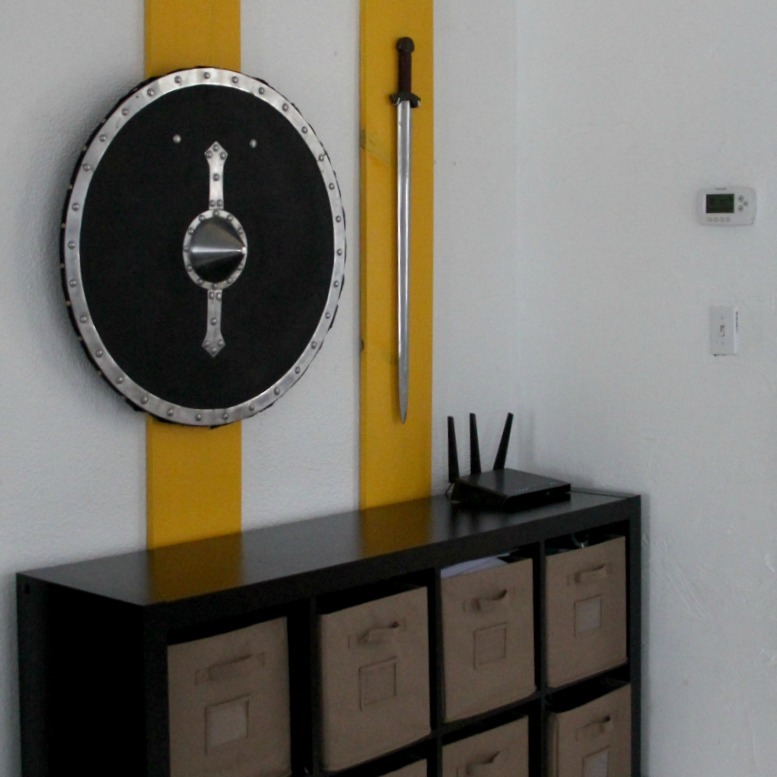 Currently, there is a Viking sword and a shield. 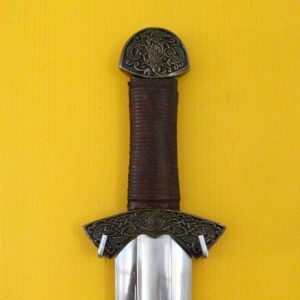 This sword is a replica of one found buried with a Viking princess. Minimalism is going to look different for everyone. Some enjoy blank walls or very minimalist art pieces, and some want intricate detail and only a few pieces, others prefer large collections on the walls and very little furniture. Thank you so much for the double room tours! I love every inch of your home. It is a huge inspiration; decor wise! One couch for all of you?! LOL! Being open with the world about the inside of your home is very personal, but please know how grateful we are for being able to see minimalism in life, with a real family. Your style is spectacular! Home tours are my favorite thing to see! Keep it coming! God bless! Thank you for opening up your home for a tour! Its helpful to see your practical ideas in a visual format. Our family has recently moved into a new home and I was reminded again to question what is really necessary when decorating and setting up a home. And like you, I also listened to David Platt’s sermons on materialism . Wow, what an eye opener!It makes me pause and question my purchases. I am new to your site and enjoying it very much! Do tell us how you manage w one couch!! I love it! Room for a piano would be awesome. Our dining room has a table that seats 8 comfortably but the 10 of us squeeze in! Then theres our school book- bookcase. It also holds my sewing machine and mail, papers etc. Then the ironing board. But if I had my way I would have more space. Not more stuff b/c i do like simple. Just more space to move! Thank you for sharing! I am curious about your window seat! Can you show a picture? I would love to see a picture of the piano, too! I like it. Your home is so peaceful looking. Thanks for sharing! I know you have a big family, I have 3 kids myself and I’m wondering how you handle the entryway, especially during winter? I feel like we get overtaken with boots, hats, school shoes, backpacks and the like – at any given point we could have 5 pairs of boots, 3-4 pairs of shoes and I just don’t know how to keep it minimal!